4 Bedroom 3 Bath Home with Private Pool just steps from the beach. What more could you want in a vacation home!! If you want to be very close to the beach, have your own PRIVATE POOL and enjoy a tastefully decorated beach home, then this home is for you!! Access to uncrowded sugar white sand and private beach is hassle free. We are so close to the beach you can hear the waves and the beach access is just steps away! Leave the crowds behind and enjoy the most beautiful beaches in the world almost to yourselves! Check out the map to see how close we are to the beach. Many rentals in the area are on the north side of the highway and require longs walks and crossing traffic to get to the beach. Our street is quiet and gated. (steps away from the beach walkover) and features a beautiful large heated private pool!! Located south of scenic highway 30 A in a secluded gated community neighboring WaterSound, we are just a short drive(approximately 25 - 30 minutes) away from Destin and Panama City Beach. This ideal vacation home features easy GULF and LAKE access, vaulted family room ceilings, a well appointed kitchen, an open floor plan and a bunk room for kids! Getting to the beach is easy with your private beach access right outside the door. Families will love the easy beach access, kids bunk room (with built in bunks and a large flat screen TV), nature trails, and proximity to shops, restaurants and activities in the neighboring communities of Seaside and Rosemary Beach. Everyone will love being so close to the gulf that you can see and hear the surf from the dining room table! Relax and enjoy your favorite book in the large open family room which features two attractive sitting areas, a queen sleeper sofa, original artwork and beautiful views. Enjoy a cozy meal for two or a feast for the entire family at the beautiful antique barge board farm table. Cooks will love the well appointed open kitchen (and the easy drive to grocery stores and markets). If you are not a cook, there are many top rated restaurants just minutes away. Don't leave your canine family member at home! We are one of very few pet friendly rentals in the area. Your well behaved dog is welcome with prior approval. Pets will enjoy the miles of walking and biking trails in the area. Pet owners will enjoy the peace of mind that comes with a quiet subdivision and no busy streets. Local pet ordinances and pet fees apply. Nearby you will find the beautiful Camp Creek Lake with a private dock to enjoy to gorgeous evening sunsets. Kayakers and fisherman alike will love having the choice of the coastal lake and the gulf for variety! Spend the day on the beach or relax with a book. Once you tire of the beach, take a dip in your own private pool or relax in the shade on the deck. You are only minutes away from the towns of Seaside and Rosemary Beach, where shopping, strolling and dining await. Browse in the galleries, have a cup of coffee or get ice cream for the kids..all within a bike ride or short 5 - 10 minute car ride away! You can rent bikes, paddle boards, and beach chairs from a number of local companies. They'll deliver the bikes and set up chairs daily. Play a round of golf in the morning at one of the many nearby top rated courses or spend an afternoon visiting the many local shops and restaurants. Finish off the day by enjoying the fiery sunset on the private dock overlooking Camp Creek Lake. Grill your favorite dinner while the kids swim in the pool! It is all here and waiting for you at PERFECT CIRCLE. Other features include SMART TVs (log in to your account for streaming services like NETFLIX and watch like you are at your own home), sound system, secure high speed wireless internet access, charcoal grill, outdoor hot and cold shower, and large master bedroom with King sized bed. Whatever you choose, you are sure to enjoy your stay at this charming beach home!! Book your reservation early as this beautiful home fills up quickly. NO COLLEGE SPRING BREAK RENTALS! We chose to buy a home in S. Walton County because you cannot find prettier beaches anywhere. The sugar white sand the the crystal clear waters are unique to this part of Florida. Our home is just steps from the beach. There are no busy streets to cross! There are many shops and restaurants nearby at the quaint towns of Seaside and Rosemary Beach. There are no crowds as our neighborhood is private. You have the best of both worlds....beautiful beaches, restaurants and shopping, but privacy and space on the uncrowded beaches. In a word 'Perfect'. This home features a master bath with large tub and shower upstairs, 2 renovated full bathrooms downstairs and a private, completely enclosed outdoor shower with for extra convenience and capacity. Views of Camp Creek Lake in the distance! Parking for up to three cars in driveway. Please do not park on grass! Secure high speed wireless internet access. large open family room for all to enjoy. Cuisinart drip coffee maker, paper filters not required AND a percolator are available for your use. Well equipped kitchen features new gourmet stainless steel appliances and eating counter. Opens to family room for visiting while cooking. Beautiful barge board farm table seats your entire family plus room for extras at the eat in bar. Enjoy hearing the surf from the front balcony. Beautifully landscaped pool right outside the door. Pool is approximately 12 X 24, features large shaded and sunning deck area, wide step area for little swimmers, is fully gated, and is approximately 5 1/2 feet deep at its deepest. The pool can be heated in cooler months for an additional fee. Please inquire. Heated Private Pool, Steps to Beach, secure high-speed wireless internet access, Outdoor Hot and Cold Shower, SMART TVs (new in 2018) with Cable TV, DVR, Stereo, Well Equipped Kitchen, Linens provided (please bring your own beach towels). Portable crib and baby gates provided at property.! You can rent bikes, paddle boards, and beach chairs from a number of local companies. They'll deliver the bikes and set up chairs daily. 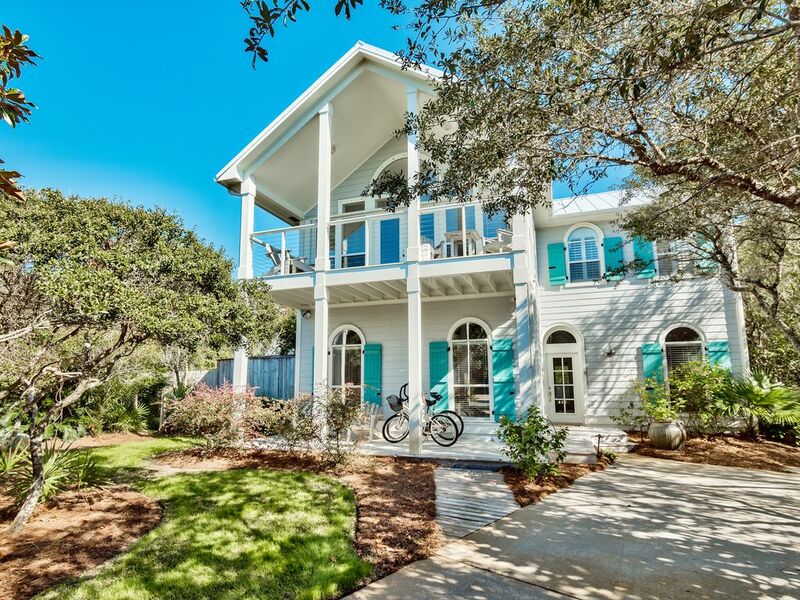 Close to Rosemary Beach, Alys Beach, Water Sound, Water Color and Seaside. Full service grocery stores less than 10 minutes away. Multiple restaurants nearby.